Your browser is not able to display frames. Please visit oos flow chart on MindMeister. Follow along with the flow chart above to determine what action is needed based on your results. Sample results are evaluated against an action level. The lead action level is exceeded if the concentration in more than 10% of samples is greater than 0.015 mg/L (i.e. the 90th percentile lead level is greater than 0.015 mg/L). The copper action level is exceeded if the concentration in more than 10% of samples is greater than 1.3 mg/L (i.e. the 90th percentile copper level is greater than 1.3 mg/L). This calculator is for your use. The 90th percentile is automatically calculated in our database, so you do not need to send your calculations to us. If your lead or copper 90th percentile result exceeds the action level, contact the Division immediately. Follow-up Samples are required when initial testing results are above 13 ppb for lead and 1200 ppb for copper. Follow-up sampling helps to confirm the presence of elevated lead and copper concentrations and gives information on the location of the possible source of contamination. Follow-up sampling consists of one or more repeat first draws samples, a flush sample, and a sample taken from the meter. Follow-up samples are submitted to the lab in much the same way as routine samples with two key differences on the laboratory chain of custody form. Follow-up samples should be labeled as confirmation samples (CO) as opposed to routine to differentiate them from normal compliance samples. Additionally, in the comments section of the chain of custody form each sample should be labeled as either First Draw, Flush, or Meter. A confirmed 90th percentile exceedance or a history of high results may require a system to implement a corrosion control program. 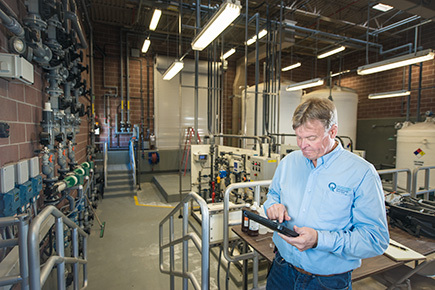 The implementation of corrosion control is a ten step process in which the water system and the Division work together to develop an individualized corrosion solution. 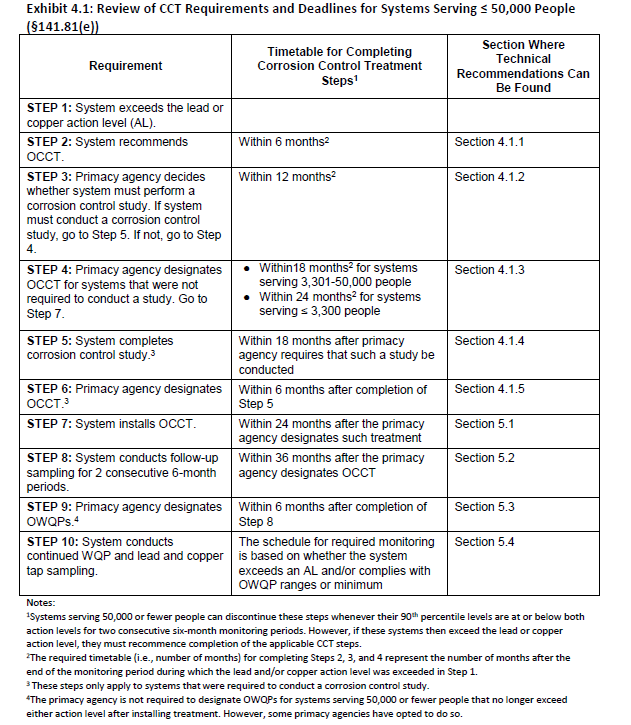 The table above is an overview of the implementation process for systems with fewer 50,000 people or less. A similar process exists for larger systems.